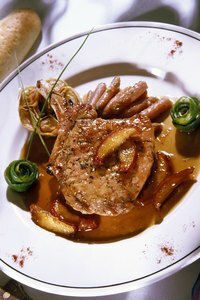 Moist and tender pork chops can be difficult to achieve as they are notorious for drying out when cooking. Traditional cooking methods like pan or oven roasting easily result in dry pork chops, especially if a careful eye is not trained on them. Pressure cooking offers the perfect solution as cooking with pressured steam bathes the chops in moisture, resulting in juicy, tender pork. Add pineapple juice before putting the lid on and after just a few minutes you’ll have delectable sweet and savory pork chops. Heat your pressure cooker to a medium high heat, uncovered. Season the pork chops simply with a pinch of salt and pepper, if you would like. Add the pork chops to the pressure cooker and cook briefly, browning on both sides. Bone-in or boneless pork chops may be used. Add pineapple juice. You can also arrange pineapple chunks or rings on top of the pork chops in addition to the pineapple juice. Add vinegar and brown sugar if you would like to give your pork chops a more intense sweet and tangy flavor, or give your pork chops an Asian zing with the addition of soy sauce and ginger. Add additional seasonings to taste, if desired. Lock the pressure cooker lid in place and bring to a high heat. Immediately reduce the heat to low to maintain the heat and pressure throughout the rest of the cooking process. Pork chops with the bone in that are 1 inch thick take approximately 8 minutes to cook, boneless with the same thickness approximately 7 minutes. Adjust times as necessary depending on the thickness of the pork chops you are preparing. Remove the pressure cooker from the heat and carefully release the lid. Remove the pork chops from the pressure cooker and let rest a few minutes prior to serving. Pair simply with mashed or roasted potatoes or serve with rice and stir-fried vegetables. Add at least a cup of cooking liquid to the pressure cooker before putting the lid on so that the dish steams properly. Add onions and peppers before putting the lid on to introduce more flavor dimensions. There are many different types of pressure cookers available ranging from electric to stovetop. Familiarize yourself with your owner's manual before you begin cooking. Never fill a pressure cooker more than two-thirds of the way full as steam needs space inside the pressure cooker to build up. What Foods Are Unsafe for a Pressure Cooker?